This level of pollution causes many, many problems. And let’s be clear I’m not going to delve into all of the many serious health issues that air pollution at this level can cause. But pollution can play absolute havoc with your skin…. and as skin is kinda my specialist subject, lets talk about this. Pollution particles are very small and can get deep into your epidermis. Here they create free radicals - which are super unstable molecules that can damage your skin cells. Expect inflammation, dehydration, sensitivity, pigmentation, and a loss of elasticity. Luckily there are products out there that can help to prevent this damage. Just like S5 Skincare's line of "Anti Pollution Skincare", which BBB favourite A Beautiful World stock. It’s important to note that your first line of defence should be healthy, cared for skin. So there’s no reason to freak out and replace your entire skincare routine, healthy skin is a great barrier in itself. But have a read below and do think about little things you could change, or add into your current line up. Make sure you are always double cleansing at night. This is super important if you’re wearing an SPF (which you should be! ), or makeup. You need to completely remove any impurities; pollutants, foundations, sunblocks. I’ve been using S5 Skincare’s Neutralise Cleanser which is perfect for double cleansing. It’s gentle and silky in texture, and manages to remove all my eye makeup in a couple of goes. After using oil cleansers for so long, this is quite a welcome change. It feels so light, and leaves my skin happy and hydrated. The Neutralise Cleanser contains some beautiful ingredients, like the African Moringa peptides. Moringa has traditionally been used to purify water. It helps to remove invisible layers of micro particles (is. pollutants!) so as your cleanser is washed away you are left with skin that can breathe! S5 skincare has also included Prickly Pear Cactus Extract, which is incredibly soothing and hydrating - counteracting the free radicals. Antioxidants are pretty much the super heroes of anti pollution skincare. Free radicals are unstable as they have an unpaired electron. They damage the skin by coming along and nicking electrons they can find. This can do serious damage! And with all the free radicals about from pollution, UV rays, and smoking, our bodies can be a bit overwhelmed by it all - and this is called oxidative stress. Luckily this is where anti-oxidants come in. They can neutralise the free radicals by offering a spare electron (how kind!) This means that the free radicals latch onto the antioxidants INSTEAD OF the skin cells. Meaning damage avoided! Phew! 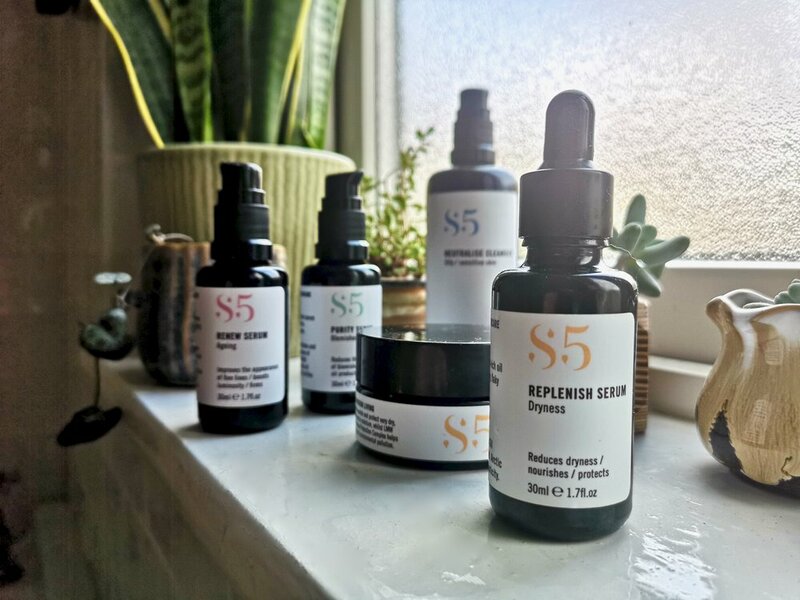 The S5 Skincare line carries many products packed with lovely antioxidants. Try the Replenish Serum that contains Arctic Sea Buckthorn, rosehip oil and Biomimetic lipids and ceramides. Buckthorn is one of my very favourite oils, and has an incredible colour to it. The serum smells dreamy and is very light for such a nourishing product. I’m a fan! I’ve even been using it on my clients - and have had brilliant feedback. The Replenish Serum is also just such a great product for this time of year while your skin is having to deal with cold weather, plus central heating etc! By layering up your products you are creating almost tiny layers of protection, which help to keep those nasty pollution particles out. The S5 Skincare Restore Cream is perfect for this. It was designed for dry, sensitives skins, and contains biomimetic lipids and ceramides and low molecular weight hyaluronic acid. Of course, as these are such soothing, nourishing ingredients, they equally help to neutralise a little of the damage caused by pollution. The Restore Cream also contains S5’s Extreme Protection Complex, which they describe as “a blend of 3 different actives which together work to defend the skin from the effects of modern living”. It contains Desert Glycoproteins, Wild Indigo and Marine Laminaria or Golden Seaweed. Each of these ingredients have incredible, clinically proven benefits to soothe and even prevent pollution damaged skin. Do have a read about them all HERE. A few last tips to help your skin in all this pollution - exfoliate twice weekly, keep drinking water, eat your antioxidants and WEAR AN SPF… EVEN in the winter. Right… now that’s all sorted, how are we going to solve the actual problem here, get rid of this pollution… and save our beautiful planet?